“Let me just say that Ben’s camp was an absolute delight!! It’s a very well run and organized camp with never a dull moment. Ben is great with the kids! Once again he threw the football to every camper so they could have chance to ‘catch a pass from Big Ben’! Both of my grandson’s caught their passes! YEAH!! Thanks so much to Ben for a wonderful experience for my grandsons! !” – Anita Doddroe, June 19, 2012.
but it’s not too early to sign your child up to join Ben this summer for some football instruction and fun at his Annual Football Camp, sponsored by ProCamps Worldwide! In fact, registration opens today – Friday, January 25th! The Camp is open to boys and girls, ages 7-14. Ben will be joined by a selection of the top prep and college coaches from the area. Each day, the campers will experience various stations, specializing in fundamental skills of football. Individual groups will be small to assure that each camper gets maximum instruction. Ben will give daily talks highlighting the finer points of the game of football and beyond. Parents and guests will be able to listen to camp guests in designated areas at each location. And you never know which of Ben’s teammates will show up to help out #7! 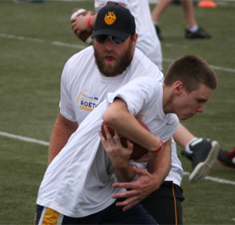 Kids that attend Ben’s Camp have had the opportunity to meet and get instruction from Brett Keisel, Charlie Batch, Willie Colon, and even Coach Tomlin! 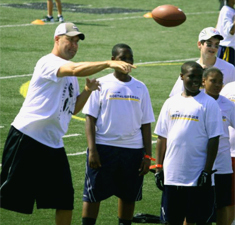 *If you use the code BigBen7 when you register, you’ll receive a $20 discount off the registration fee, courtesy of ProCamps! In the event of heavy rain or inclement weather, the camp will be moved to a nearby indoor facility. Camp instruction and other related activities will continue inside the facility. Parents will be notified of the indoor location in the Camp Bulletin that they receive at check-in on the first day of camp. Additional camp partners include Greater Pittsburgh Physical Therapy and McDonalds. Media partners include KDKA-Channel 2 and WDVE. A fun and educational experience is guaranteed! Spots are limited, so participants are encouraged to register early. You can sign your youngster up for the camp here. You can watch videos from the camp here (mid-way down the page). You can read more testimonials from parents and grandparents here. Shout-out to Big Ben fan, Justin Huser! Soon after appearing in our Lil’ Fans album earlier this week, Justin found himself in the hospital after a serious bout of Chronic Asthma, something he has been dealing with since birth. The bright-eyed and always busy 2-1/2 year old is back home and doing much better. “What makes it hard is Justin loves football so much and he reenacts every play,” said his mom Amber. “His love for playing unfortunately exacerbates his asthma. It’s hard to get him to sit still! But, I’m sure this is a small bump in the road and he will overcome and go on to be a Super Star one day!”. Just like his favorite player! 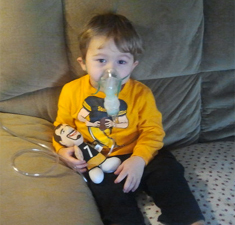 Steeler Nation, keep this little fella in your thoughts and prayers as he overcomes this “bump in the road”!